During the last 3 years, eye-kon has produced several bespoke CGIs for marketing purposes in cooperation with FutureBrand, a marketing consulting specialist based in London. eye-kon has delivered 3D models, interior and exterior architectural visuals for several projects. These visuals have helped fine-tune the conversations between FutureBrand and its international client base, allowing all stakeholders to preview the end result of each project. 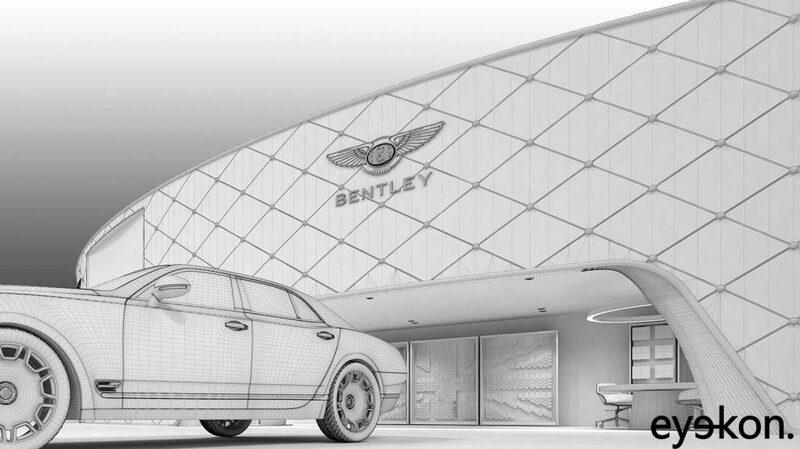 Among other projects, FutureBrand commissioned eye-kon to deliver CGIs for over 20 different designs related to the redefinition of the Bentley brand. 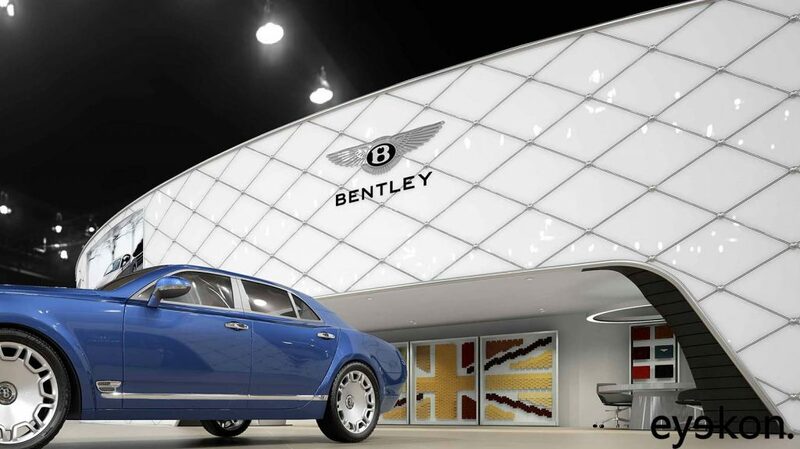 These included the redesign of the headquarters of Bentley Motors in Crewe, the new Bentley Boutiques in Dubai and Doha, and the exhibition space design for the top motorshows around the world. The interior visuals we produced focused on the show-stopping redesign of the reception space, hospitality areas, and shops of HQ and dealerships in London and the Middle East. They implied creating bespoke photorealistic reflections and lighting effects to convey the deluxe customer experience which is at the core of this specific marketing project. eye-kon produced still images as well as fly-throughs (available here). The exterior photorealistic visuals, particularly of the new flagship stores in the Middle East, were aimed at demonstrating the wow-factor delivered by the newly designed hospitality spaces, which turn a car dealership into a VIP experience, fitting naturally alongside other luxury brand that populate this very specific urban context. 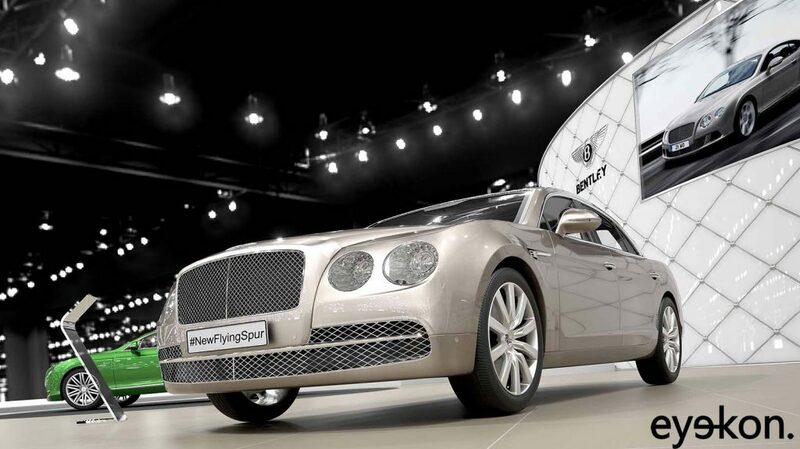 eye-kon also modelled and produced CGIs for the Bentley Motors exhibition space for the Geneva, Paris and Shanghai motorshows. 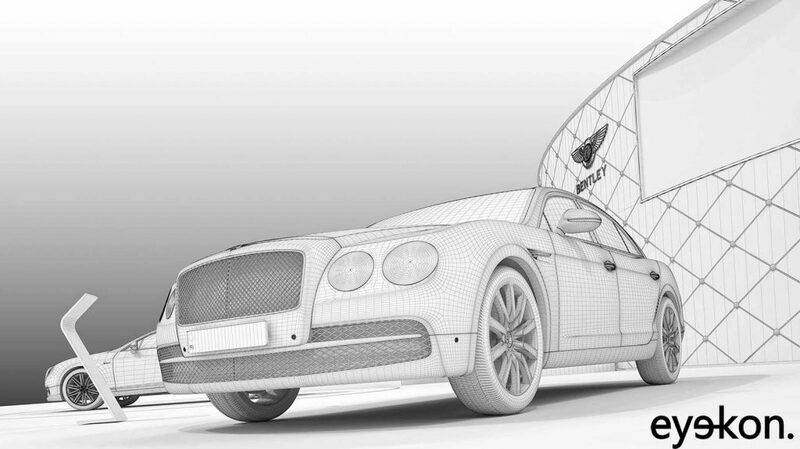 The 3D model and the visuals became the key tool in the hands of the FutureBrand and Bentley team to test and plan the best layout to be delivered at the shows, including selecting which car model and colour to make the best use of the space available. The main challenge was to replicate in the CGIs exactly the look and feel of the expo hall interior – without the crowds – and replicate the effect that multiple direct spotlights have on the shiny curved surfaces of the cars. eye-kon’s architectural visualisations fulfilled FutureBrand’s need to demonstrate global design consistency, while remaining extremely time-efficient.